A dispute has erupted between Burger King and one of its franchisees over global warming. The franchisee, Mirabile Investment Corporation, had placed the political statement "Global Warming is baloney" on a dozen outlets across Tennessee. Corporate Burger King ordered the statement taken down, and the franchisee has refused. The controversy erupted when a Memphis newspaper reporter discovered the signs and then contacted corporate Burger King for comment. The burger biggie ordered them removed. 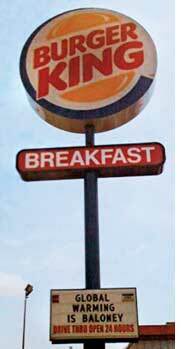 The marketing president of Mirabile, John McNeils, refused to take down the signs, "I don't think Burger King would run from controversy like cockroaches when lights are turned on. I don't know of any direction they gave the franchisee and I don't think they have the authority to do it."